The Copper Age began in Bulgaria ca. 5200–5000 BC, but Old European copper-trade network included the Pontic–Caspian steppe groups only after ca. 4600 BC. In the period ca. 4800–4000 BC, Trypillia ceramic imports appear at the Neolithic Dnieper sites. In the forest-steppe region, they occur on a number of sites belonging to the Kyiv–Cherkassy variant of the Dnieper–Donets community, and later imports reach into the forest zone, into the territory of the Pit–Comb Ware culture. Prestige objects begin to appear at this time on the north Pontic region, too, marking the beginning of the prestige exchange (Rassamakin 1999). There is no gap between the Neolithic cemeteries of Nikolskoe, Lysogorskoe or Mariupol and the emergence of the first Sredni Stog burials, which mark the advent of the Eneolithic. In fact, certain prestige objects appear in Neolithic cemeteries before their demise, and flint workshops on the Donets—which become quite relevant during the beginning of prestige exchange in the region—can be traced back to the late Neolithic (Mariupol) industry (Rassamakin 1999). 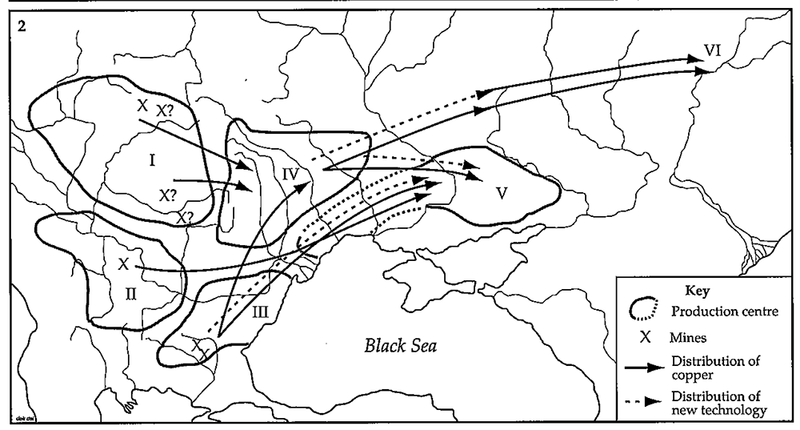 The expansion of Khvalynsk–Novodanilovka connected Early Eneolithic sites, from the Lower Danube (Suvorovo, Cernavodă I) to the Kuban region, bordering on the pre-Caucasus region (with pre-Maikop Trans-Kuban culture) to the steppe and forest-steppe Volga region of the Khvalynsk culture. The expansion of Suvorovo to the Lower Danube, with its contact with rich local agricultural settlements, sets into motion a long-distance prestige exchange system, and the tradition of rich burial assemblages that expands through cultures of the north-west and north Pontic region (Rassamakin 1999). The economy of the region included sheep–goat, cattle, and horse bones, and it seems that sedentarism was the rule, with hunting playing a significant part in the diet. Trade in this period was based around copper and copper artefacts, from two main extraction regions: the Middle Danube area and Thrace. Finds from the steppe up to Khvalynsk show that Novodanilovka was associated not only with the distribution of the first copper artefacts in the steppe, but also with the establishment of an independent metalworking focus in the Black Sea region, which used Thracian–Lower Danubian and Middle Danubian ore, as well as Trypillian, Varna, and Gumelniţa technology (Rassamakin 1999). The lack of complex copperworking in early Khvalynsk suggests that all the copper finds in the Volga and pre-Caucasus region were imports from the west, and rich copper assemblages in the Dnieper and Donets regions seem to occur at regular intervals or suitable stopping places along the main route (Figure 14), which—together with the flint processing remains—points to north Pontic groups as intermediaries (Rassamakin 1999). Figure 14. Distribution of copper and new technology in the steppe area from the different production centres (after Ryndina 1993, fig. 1). I-VI are production regions (metalworking centres): I) Tisza – Transylvania; II) Middle Danube; III) Thracian – Lower Danube; IV) Carpathian-Dnieper; V) Northern Pontic; VI) Middle Volga. From Rassamakin (1999). Metal hoards of the initial Chalcolithic (ca. 4800–4200 BC) coexist with the first great wave of the Alpine jadeites. The Danubian axe and adze hoards phenomenon flourishes in central Europe, covering the area between the Meuse and the Vistula rivers. By 4600/4500 BC, a ‘Europe of hoards’ extends from Brittany to the Carpathian Mountains, in non-metalworking Neolithic societies. Isolated finds of giant (‘elite’) mounds, the Carnac mounds, built for a single individual, are found in this copperless western Europe at the same time as those in Varna I. A vast distribution network of Alpine axeheads and its corresponding hoard phenomenon in the west is thus comparable to the contemporaneous copper hammer-axe horizon in the initial east European Chalcolithic (Jeunesse 2017). Late LBK groups, including the Lengyel, Tiszapolgàr and Bodrogkeresztúr cultures, as well as contemporaneous cultures of northern and western France, like the Cerny culture of long barrows (ca. 4800–4300 BC), show some burials with stereotypical grave goods (weapons for men, ornaments for women) which stand out from other burials, showing thus the elite status of certain individuals (usually males), although without much difference with other graves (Jeunesse 2017). The early Sredni Stog culture is characterised by a distinctive incised line and dot decoration, that spans from the Lower Don in the east to the Cucuteni–Trypillia settlements. Similar pottery decoration connected these cultures to earlier north Pontic Neolithic decorative features. Typical assemblages of these sites include typologically distinctive flint and stone artefacts, such as long knife-like blades, triangular flint spears and arrowheads, and flat axe-adzes, as well as distinctive perforated antler artefacts (Rassamakin 1999). Early Sredni Stog settlements in the north Pontic area include the earliest burials of Stril’cha Skelya, Oleksandriia on the Oskol (a tributary of the Donets), Aleksandrovsk on the Donets, Igren VIIII, Razdolnoe on the Kalmius, as well as Vasylivka, Deriïvka 2 on the Dnieper, the island of Vinogradny, and Sredni Stog II; possibly some burials of the Lower Don, a border with the eastern region, may have part of the culture, too. Contacts with neighbouring steppe cultures are evident in imported Sredni Stog materials in the Khvalynsk settlement of Kara-Khuduk in the Caspian region, and in pre-Maikop Svobodnoe in the Kuban region (Rassamakin 1999; Manzura 2005). Chronologically, the culture corresponds to the Cucuteni–Trypillia A3–4 and B1 agricultural settlements (ca. 4800–4000 BC), which show the same type of pottery in terms of technique and decoration, also found in Gumelniţa A2 (ca. 4500–3950 BC). The first copper and gold objects in the north Pontic region are associated with this period. Flint extraction and flint-working loci including mines appear in the Donets zone, the products of which correspond to artefacts from prestige burial assemblages. Oleksandriia was one such flint-processing locus, where a large quantity of both finished projectile tips, axes, long blades, semi-finished products, and also production waste was found (Rassamakin 1999; Manzura 2005). Early contacts of north Pontic populations with the Hamangia culture from the Dobruja region (ca. 5250–4500 BC) is seen in imports including adornments from copper, cornelian, marine shells and pots in steppe sites, and plates from bone and nacre, pendants from teeth of red deer in Hamangia sites. The Hamangia influence was especially important in the burial rites of the steppe population, and may have caused the use of stone in graves and above them, pits with alcove, and new adornments of burial clothes. The strongest impact is seen to the north of the Sea of Azov in the early Sredni Stog culture, with the adoption of the new religious element potentially connected with the formation of the centre of steppe metal working (Kotova 2016). · the overall settlement, which needs a political institution to direct the spatial planning of the site and combined economic activities (mega-site principle). The exchange systems in the north Pontic area during the Eneolithic included intercommunal exchange within likely related ethnolinguistic groups (such as the Sredni Stog internal exchange of natural resources, like flint materials); exchange with the nearest neighbours (such as prestigious exchange between Sredni Stog and the Trypillian, Kyiv–Cherkassy, Donets and Middle Don cultures, as well as northern Caucasus and Crimea); and long distance exchange, made far from friendly villages, probably created under the Khvalynsk–Novodanilovka network (Kotova 2008). The revolution of herding, travel, and raiding—and thus the change in the steppe—had come with horseback riding, appearing ca. 4800 BC in early Khvalynsk, and spreading south- and eastward with Suvorovo–Novodanilovka elites. They came from the eastern steppe, and they were probably involved in raiding and trading with the north and west Pontic areas during the Trypillian B1 period, before and during the collapse of Old Europe (Anthony 2007). At the end of this period, the system of interrelationships disappears: there are no late Sredni Stog pottery in Cucuteni–Trypillia; the pottery changes; there is no evidence for the production and distribution of flint artefacts of the old type; and new types of arrow- and spearheads with distinctive notched bases substitute the old projectile points in the region (Rassamakin 1999). The first pottery appeared around the ancient Lake Saimaa basin ca. 5100 BC, followed by the Early Asbestos Ware (EAW) culture ca. 4700 BC, which used asbestos as a tempering material. This culture was the prevailing type of archaeological assemblage for several hundred years, but declined and disappeared around the early 4th millennium BC. In mixed forest regions of the central Russian lowland plain to the Volga area and the Kama valley, Mesolithic–Neolithic hunter-gatherer groups like Lyalovo (ca. 5000–3650 BC) and Volosovo (ca. 3650–2300 BC) show late pricked and comb–stamped ceramic. The characteristic settlement shows partially sunken earth-houses or dugouts (poluzemlyanki), and vessels are simply formed, with a round or pointed base and imprint-decorated outer surfaces. Tools include harpoons made of flint, bone, and horn. Copper objects are rare findings, but bone or stone animal figures are typical and associated with forest fauna, such as bears, fish, beavers, etc. (Parzinger 2013). In the southern area, near the north Pontic forest zone up to the Don River, this stage of Rudnyaya culture shows continuity in relation to the previous Late Neolithic period, and cultural interaction is observed with the eastern Baltic area and through the Western Dvina (Mazurkevich et al. 2009). Two individuals of the 5th millennium BC, presumably from early Sredni Stog, show continuity with ancestry similar to the previous samples of the north Pontic area: one from Deriïvka (ca. 4630 BC), and one from Vovnihy (ca. 4430 BC) of hg. I2a1b1a2-CTS10057 (Mathieson et al. 2018). Another sample from Deriïvka (ca. 4870 BC) is a clear outlier, with fully Anatolian farmer-like ancestry—clustering closely with Balkan Neolithic and Chalcolithic samples—but shows haplogroup I2a1b1-M223, and thus probably continuity of the male population. In the Balkans, Copper Age populations contain significantly more hunter-gatherer-related ancestry, contemporary with the ‘resurgence’ of hunter-gatherer ancestry in central Europe and Iberia, and consistent with changes in funerary rites ca. 4500 BC to extended supine burial, in contrast to the Early Neolithic tradition of flexed burials. An important population replacement is supported by the presence of mtDNA haplogroups H, HV, W, K, and T in twenty-eight Trypillian samples from the Verteba Cave, contrasting with typical pre-Eneolithic lineages (Wakabayashi et al. 2017). Trypillian samples of the Middle Eneolithic (see §v.6. Late Uralians) show mostly Anatolian-related ancestry (ca. 80%) with contribution of hunter-gatherer ancestry (ca. 20%) intermediate between WHG and EHG, consistent with the local population (Mathieson et al. 2018). Based on the lack of individuals of R1a1a-M198 lineages during the 6th and 5th millennium BC—the most likely Early Uralic speakers—in the sampled populations from the Pontic–Caspian area, and their presence there and among Baltic hunter-gatherers during the Mesolithic, it is possible that communities of this lineage were at this time mainly part of the forest or forest-steppe regions from the Middle and Upper Dnieper basin, and spread to the south (“resurging” in the area) only after the Khvalynsk–Novodanilovka expansion. This wide distribution of haplogroup R1a1-M459 in the eastern European forests is supported by an individual from Yuzhnyy Oleni Ostrov (ca. 6300 BC), of hg. R1a1-M459, reported as both outside and (tentatively) within the R1a1a-M198 tree (Haak et al. 2015); the individual from Khvalynsk (ca. 4600 BC), of hg. R1a1-M459 (xR1a1a1-M417), probably R1a1b-YP1272, like a later Maykop sample from the Northern Caucasus Piedmont (ca. 3230 BC); an individual from Serteya VIII (ca. 4000 BC), of hg. R1a-M420 (Chekunova et al. 2014); and a sample from Kudruküla, Estonia (ca. 3000 BC), of hg. R1a1b-YP1272 (Saag et al. 2017). Contacts between the Upper Dnieper–Upper Don forest cultures and those of the forest-steppe continued during the Neolithic (Mazurkevich et al. 2009), which justifies their eventual infiltration down the Dnieper during the so-called steppe ‘hiatus’.